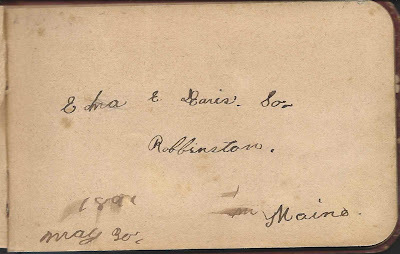 1880s autograph album of Edna E. Davis of Robbinston, Maine, in the South Robbinston area. 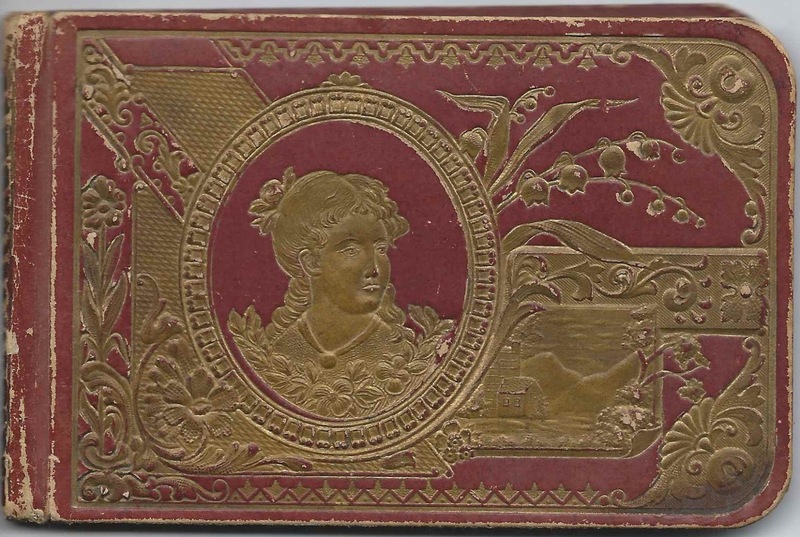 The album is approximately 5-1/4" by 3-1/4" and contains 31 pages signed by Edna, her relatives and friends. An alphabetical list of the signers in the album appears at the end of this post. 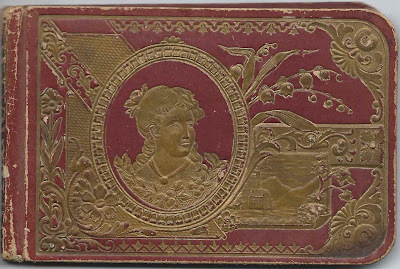 Edna E. Davis was born about August 1886 at Robbinston, Maine, the daughter of Maurice H. and Annie E. (Stanhope) Davis, who were born at Perry, Maine, and Robbinston, Maine, respectively. 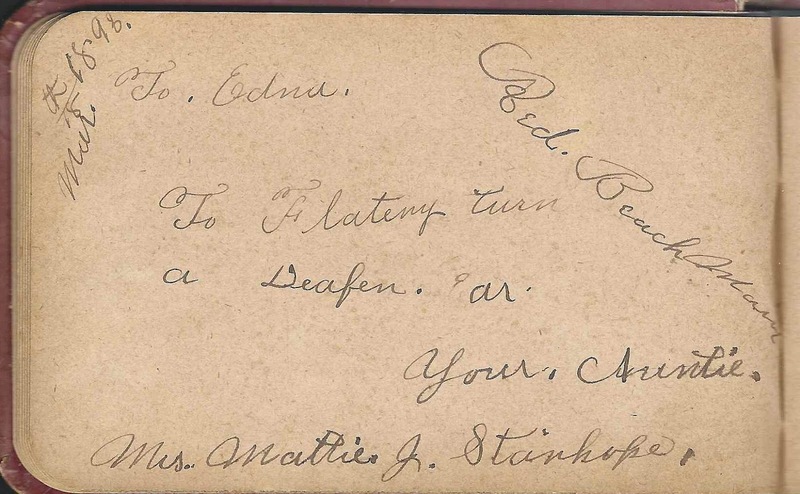 See Annie E. Stanhope's name on an 1872 teacher's register of Robbinston, Maine. 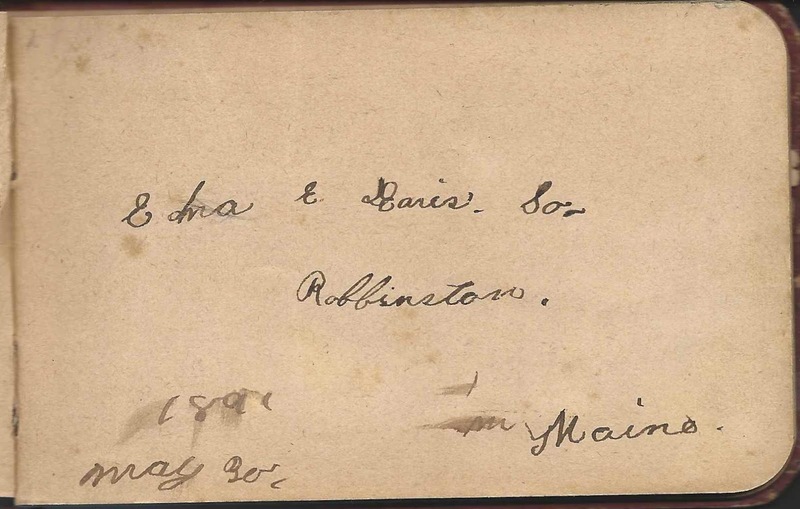 On 29 June 1910 at Robbinston, Maine, Edna married John C. Merrill, son of Henry A. and Clara (Simons) Merrill. 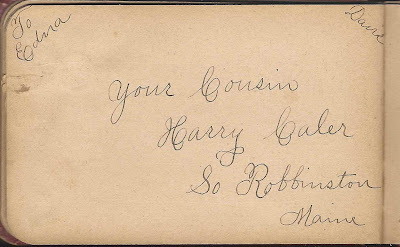 He was born about May 1882 at Starks, Maine. 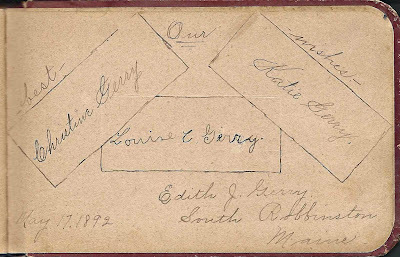 Edna and John were living at East Machias, Maine, at the time of the 1920 and 1930 Censuses. 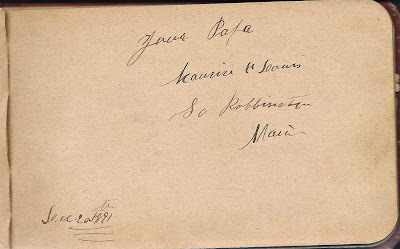 Edna's father Maurice H. Davis signed a page in her album in 1891. 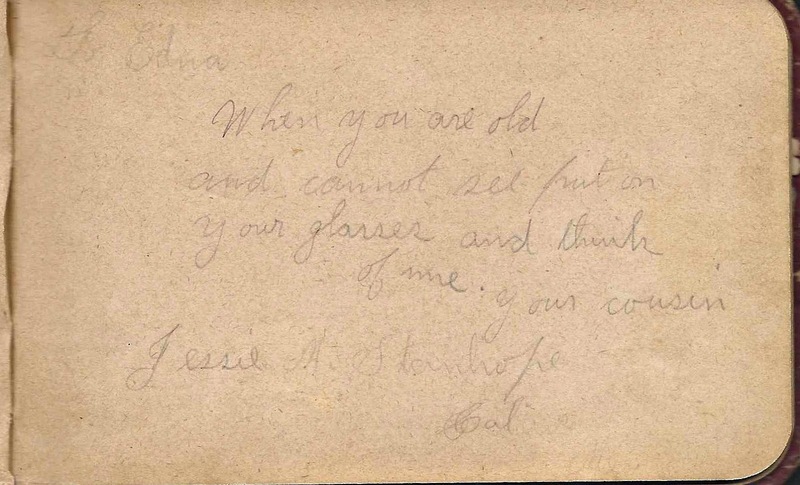 Edna's cousin Jessie M. Stanhope of Calais, Maine, signed a page. 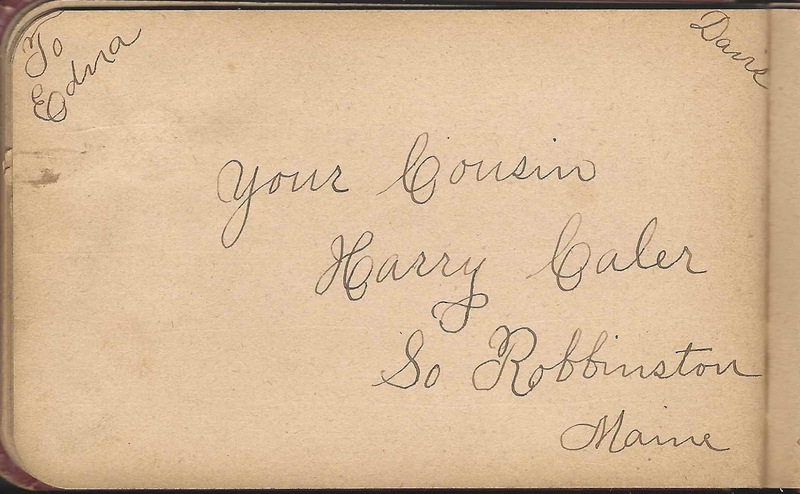 Edna's cousin Harry Caler of South Robbinston, Maine, signed a page. 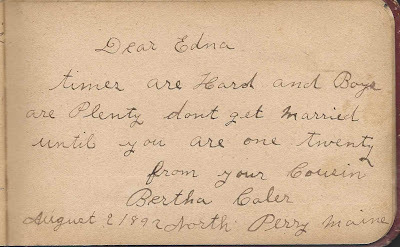 Edna's cousin Bertha Caler of North Perry, Maine, signed a page in 1892. 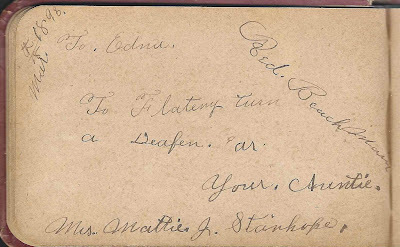 Edna's aunt, Mrs. Mattie J. Stanhope of Red Beach, Maine, signed a page in 1898. Members of the Gerry family of South Robbinston, Maine, signed a page in 1892: Katie Gerry; Edith J. Gerry; Louise C. Gerry; Christine Gerry. If you have corrections to the information above or additional information on the Davis and Stanhope families or on any of the people listed in the list of signers below, please leave a comment or contact me directly. I rather like the entry that says "Times are hard and boys are plenty / don't get married until you are one-twenty". I may need to put that onto a card for my kids. Although I need to find a way of making it rhyme where the final line is "until-you-are-able-to-support-yourself-because-I'd-like-to-retire-one-day"!